The matter is pretty much settled: Uber and Lyft are worsening congestion — especially in some of our most congested cities, undermining transit and, according to a recent study, increasing traffic fatalities. Uber and Lyft are even — whomp whomp — encouraging more people to buy cars, research has shown. 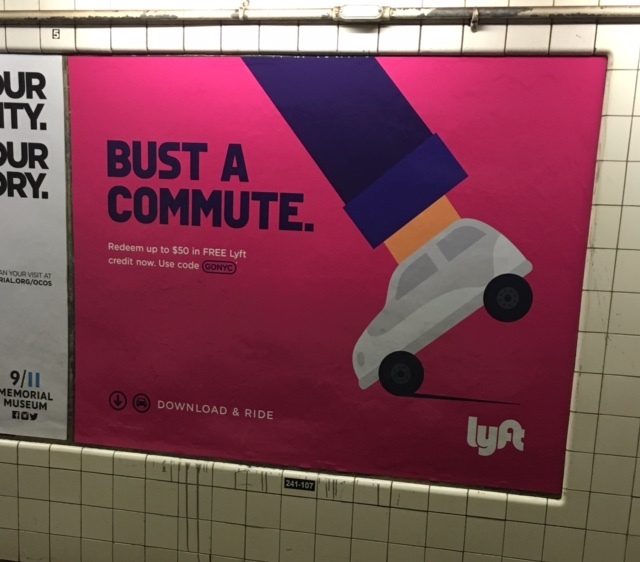 Lyft ads actually offer free car trips to people in New York as they wait for the subway. 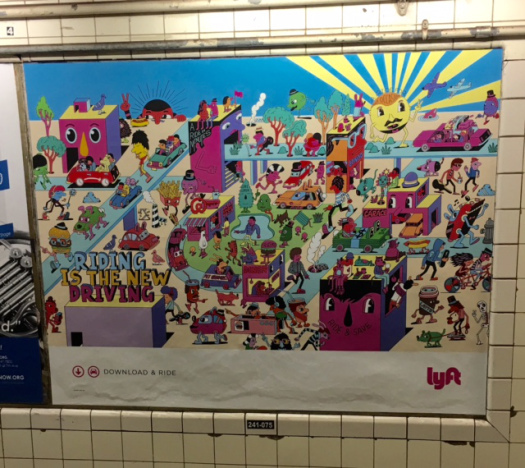 Riding is the new driving, says Lyft. Happy news right? Actually it’s not so great. Uber and Lyft cars spend between 40-60 percent of their time “deadheading” with no passenger at all, meaning even trading a car trip for an Uber or Lyft trip increases emissions, congestion and crashes. This ad appeals not very subtly to classism against the bus. You’re too important to ride a bus like a commoner, says Uber. 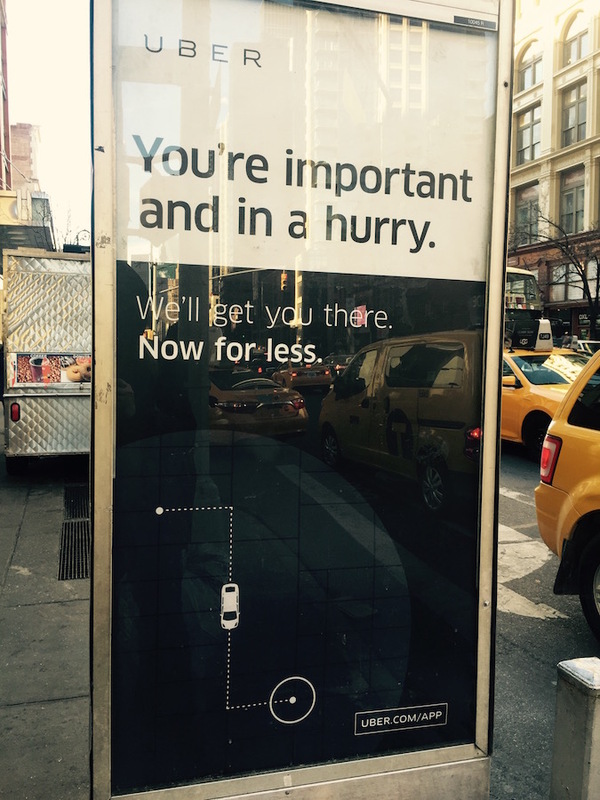 Uber knows its audience. Studies have shown Uber riders are much wealthier than the average city resident. When these folks pile out of buses and into private cars, they worsen congestion which traps lower-income riders in slower bus commutes — an added equity cost. 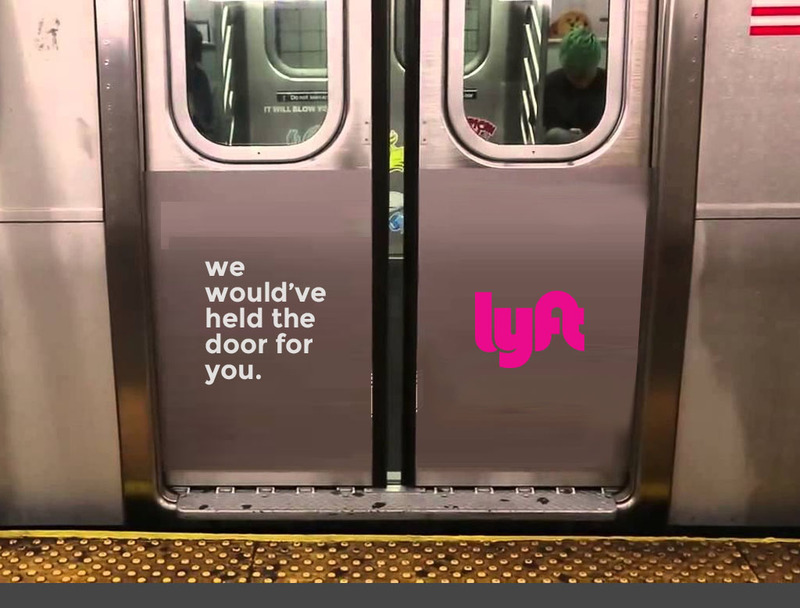 Here’s Lyft going after the bread and butter of transit agencies: Commuters — in New York City, no less. 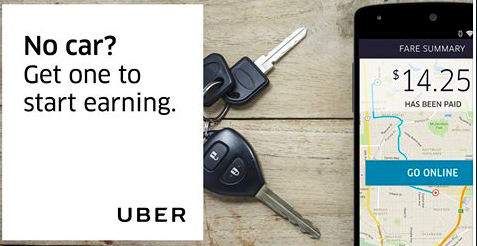 In this ad Uber urges people to make a huge upfront investment in a depreciating asset in order to make garbage wages as a contract worker with no benefits. New car registrations increased faster in cities with high Uber and Lyft adoption rates, according to a recent University of Chicago study. It’s clear that Uber explicitly encouraged that. Jarrett Walker at Human Transit, pointed out last year, Uber and Lyft advertising on New York City’s subway and other major transit hubs trying to lure riders off the most efficient form of transport into the least efficient in the most congested cities in the country especially bad. But that is exactly what they are doing. And it worked. A study from Boston found 42 percent of Uber and Lyft users were substituting the services for transit. Another study showed that vehicle miles traveled from Uber and Lyft increased the fastest in cities — like New York and Boston — that had relatively strong transit ridership, prior to their arrival. 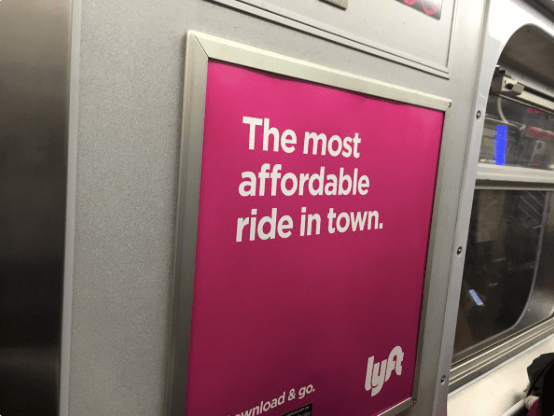 Now, in the interest of fairness, some of Uber and Lyft’s ads did focus on offering “first-mile, last-mile” connections, that comported with the way they like to officially present themselves: as being complementary with transit, as opposed to competition. But many of these other ads clearly belie that claim. Can you imagine how absurd these ads would be for traditional taxicabs? TNCs just need to remove their subsidies to charge full price. Like taxis, paying full price for an occasional trip or as a backup would level the playing field. Awwww, too bad. It clearly shows that transit riders are more than happy to ditch a train or bus even in cities that have robust transit networks (sorry, SF…you don’t fall in the robust category). No need to even provide examples. The question is: what will cities do to lure back transit riders? You really can’t fault Uber/Lyft…they are providing a level of convenience that transit simply doesn’t or can’t. 20 minutes waiting for BART + all the sketch on the platform vs. instant Uber ride. I bet that Uber and Lyft are also responsible for the bus driver shortage. They’re taking away drivers from bus agencies, which is absolute bs. You make pull away all the hidden subsidies that allow Uber/lyft to even operate on same expense plan as transit. Common sense tells you having someone personally chauffeur you around on scare road space instead of riding a train/bus that was gunna run whether you took or not should be 10 – 20x as expensive. Worsening travel times for car commuters or enhancing travel for people who choose not to drive? Perhaps it’s a worthwhile tradeoff? Or perhaps it’s not, and we should prioritize people who commute by their own car over those who use rideshare? I’m going to argue that the recent shift is a good one. 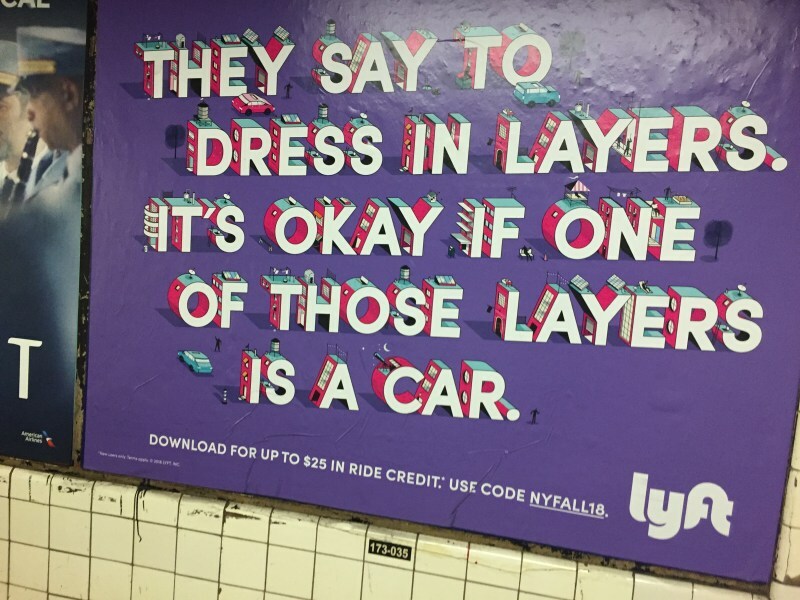 Yes, commute are slower, but people are still choosing Lyft over their own car because the travel time is “not that bad”. Same with people who keep driving because for them, driving “is not that bad” compared to a bus. I don’t agree about “hidden subsidies”. Both Uber and Lyft are plowing massive amount of money into self-driving technologies which put a huge dent on their income statements. If you exclude those, they’re both doing pretty good financially. One might ask, would you prefer your local transit agency raise taxes to spend $1 billion a year to develop autonomous buses or leave that to private sector? What % of riders are from out of town? Or on vacation? These folks need ride share to offset food and shelters exorbitant prices in the city and provide safety and comfort,I believe..
Not sure playing the ‘victim card’ is either a competitive or effective response. Uh, Uber lost $2.8 billion in 2016. They lost nearly FIVE BILLION dollars last year. They are most definitely not plowing $5 bill a year into self-driving tech or even R&D overall each year. Every ride you take is financed by venture capital. Uber is absolutely a long way from “doing pretty good financially” if you exclude their investments. It’s just not true. Their business model is a net loser today and won’t change anytime soon until they become a full-fledged mobility company (the ultimate endgame), which has always been the target. “hidden subsidies” like not paying their employees a decent wage or providing them the benefits that come from being official employees. “hidden subsidies” like ignoring the taxi regulations that exist to protect everyone. The lesson of TNCs over the last 3-4 years is that a material portion of transit riders are willing to pay considerably more for a convenient & comfortable ride. In my opinion, that’s cause for quite a bit of optimism for transit agencies. There’s tremendous opportunity out there to improve the quality of service & the ridership base has spoken that they are willing to pay for it. Our agencies are losing ridership to mode that often costs 5+ times as much. An analogy is everyone was staying at the roach motel and a ritz carlton opened across the street & took half the business. Don’t double down on the motel model. Get better. We could prioritize building safe cycling infrastructure and speeding up bus service via technology and bus lanes. I doubt it. Most Uber and Lyft drivers make low wages and would probably make more money as a bus driver. Uber acting to the detriment of society? It CAN’T be! Almost all of the people I pick up using Lyft are in areas with no mass transit directly from point A to point B. Maybe it is different in NYC or San Fran, but this is Atlanta, a major metro area that still has large portions of people not served by mass transit. That describes most of the country. Also, I used to ride the bus to work and the transit time was easily 30 minutes longer than a direct Lyft would have been if it existed at the time. People want convenience. And they’re willing to pay for it.